Board Surfing at TYF AdventureSurfingOne of the coolest sports on the planet. Surfing’s combination of exhilarating rides, paddling effort and the patience needed to catch the next wave or swell make it one of the most addictive sports that we’ve ever known. TYF have been teaching surfing in St.Davids for three decades and love the smiles and achievement of thousands of people catching their first rides on the waves of Whitesands or Newgale. Surfing’s combination of exhilarating rides, paddling effort and the patience needed to catch the next wave or swell make it one of the most addictive sports that we’ve ever known. 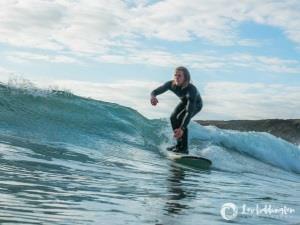 TYF have been teaching surfing in St.Davids for 30 years. Check out our surfing adventure options on the beautiful blue flag beaches of St Davids Pembrokeshire. Price options available, group discounts. Follow the A487 to St. Davids (Tyddewi). In St Davids Follow the one-way system until the T-junction (Nun Street / High Street). Turn left, then take the second road on the right (first road is a no-entry) signposted ‘Caerfai’. There is a large car park on the left followed by a small lane. From the car park entrance, follow the path past Oriel Y Parc (Tourist Information Centre) and continue onto the high street the shop is situated on the right hand side, just before you reach the stone cross in the city centre. Take the train to Haverfordwest, then Richard Bros bus 411 to St Davids. There is a bus stop outside St Davids City Hall, 50m from our front door.